Ahment Türk, the Co-Chairman of the Democratic Society Congress (DTK), a pro-kurdish party in Turkey, said that Kurds were part of the policies implemented in 1915 against the Armenians, Assyrians and Yezidies. Ahmet Türk is an independent deputy from Mardin, south-east Turkey. The Turkish Milliyet Newspaper reported on an interview aired with IMC-TV station where Ahmet Türk was interviewed by the journalists Roni Margulies and Hayko Baghdad. Answering a question, Ahmet Türk stressed that Kurds were used in the massacres against the Armenians, Assyrians and Yezidis and requested that Turkish people must apologize too. ”The Armenians suffered greatly in 1915. The Kurds have their share [of guilt] in this too. Kurds were used. The local population faced a persecution. Our fathers and grandfathers were used against Assyrians and Yezidies, as well as against Armenians, they persecuted these people, their hands are stained with blood. 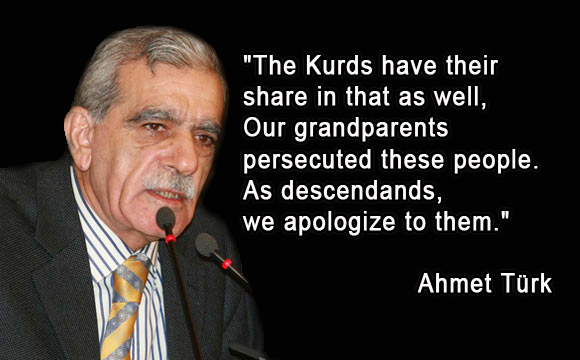 We as the descendants apologize. I think it is important to receive apology,” Türk said. He continued saying, ”Using propaganda, Kurdish people persecuted Armenians. We are very comfortable to be able to express anguish and suffering. Showing such greatness, Turkey too should apologize to the Armenian, Yezidi and Assyrian people. As those events happened before the [Turkish] republic came into existence, what obstacles are there?” he asked.